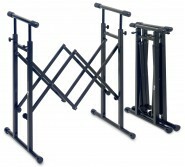 Dimensions (W x H x D): 73 to 111.5 x 59 to 71 x 32 cm (28.7 to 43.9 x 23.2 to 28 x 12.6") Dimensions when folded (W x H x D).. 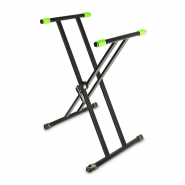 Suitable for: All keyboards, DJ mixing consoles or turntables Material: Steel Width: 84 cm (33") maximum Depth: 50 cm (..
KSX 2 The KSX 2 is a hardwearing double brace X-style keyboard stand with 65 Kg load capacity. 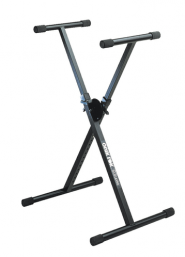 A quick release clamping l..
Portable Full-Sized Keyboard “X” Stand with Collapsible Telescopic Tiers Leg depth: 19.5” - 49.5 cm .. 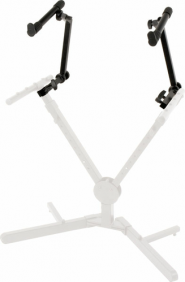 Angle, height & tilt adjustable tier add-on for QLY/40 Keyboard Stand Tier depth: 11.8” - 3..